One summer day, an unbelievably gigantic cumulonimbus cloud was inscribed on the memory of a boy. He imagined that if he could climb such a great mountain like the cloud, it would be the best experience. Longing for a place near the sky, the man started authentic mountaineering and was obsessed with Mount Fuji, the highest mountain in Japan. Then, just one photograph that he took from the mountain top of Mount Fuji led him to the world of photographs. 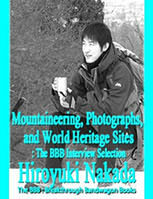 This guy, Hiroyuki Nakada, is a Japanese mountaineering photographer and holds the qualification of "World Heritage Meister," the highest rank of the Test of World Heritage Study (which occurs only in Japan). Now he talks to people all around the world by the keywords "mountaineering," "photographs," and "world heritage sites." Additionally, "Exclusive Article about Mount Fuji Being Listed as World Heritage Site" (written by Hiroyuki Nakada) is also included.